Lynne Ewing is a screenplay writer who also counsels troubled teens. She writes urban fantasy for young adults. CLICK HERE FOR MORE BOOKS BY LYNNE EWING. 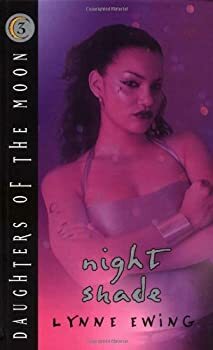 Daughters of the Moon — (2000-2007) Young adult. Publisher: Vanessa, who has always had the special power to become invisible, discovers that she and her best friend Catty, a time-traveler, are goddesses of the moon who must fight together to overcome the evil Atrox. I’ll put it bluntly: I don’t recommend this series. Granted, I’m no longer in the demographic that Daughters of the Moon is targeted toward, but I was when I first read Nightshade and I wasn’t impressed even then. The premise of Daughters of the Moon is that young girls who are delivered by the goddess Diana are infused with magical powers that they must use against the ancient evil Atrox and his various minions. It's the girl-power meets evil-bashing type of book, a ploy that usually works, but to be honest — there’s better stuff out there that covers the same ground. Sons of the Dark — (2004-2005) Young adult. Publisher: Obie hates Los Angeles and all the junk that goes with it-especially trying to fit in at Thomas Turney High School. But with bounty hunters trying to capture him, his Renegade roommates urge him to lay low with his band and forget about ever getting back hoome. it’s hard to blend in at school, though, when you’ve just made enemies with the football team. Obie can’t keep away from Allison, the most popular girl in school and the girlfriend of the star quarterback, Sledge. And when his true love, Inna, shows up and pleads for his help, Obie must return to the one place he fears most. Sisters of Isis — (2007-2008) Young adult. Publisher: Meri, Sudi, and Dalila are three girls who live in Washington, D.C., but have little else in common. Or so they think. When an ancient magic is revealed, so are their true identities as Sisters of Isis. Sudi is thrilled when she finds a mysterious invitation in her locker. Only one person could have invited her to dinner at Sky Terrace — her not-so-secret crush, Scott. But when she shows up to meet him, things don’t go as planned. Instead of Scott, she finds a strange guy named Abdel, with two girls she’s never met before. Abdel claims Sudi and the other girls are the descendants of Egyptian pharoahs, powerful ancestors who have given them magical gifts and powers of transformation. At first, Sudi refuses to buy any of it. But when evil forces begin to threaten her world, she has no choice but to believe.